Christmas is holy in many countries in the world. I saw Christmas decorations also in Chengdu two years ago during the ISPRS Council meeting. It seems that Christmas is famous also in countries with non-Christian origin. Therefore I would like to describe how Czechs celebrate it since the celebrations differ in individual and even neighboring countries. Christmas is a religious festival, which derived also from the celebration of the transition from autumn to winter and the prolongation of daylight. There are generally three tasks to be fulfilled before Christmas in my country. People, better to say, housewives want to tidy up their flat or house. That is why they wash windows, doors, clean all cupboards, wardrobes, etc. It is a terrible period for most men even when they are not included in these activities. They only face the fact that the house is untidy due to windows without curtains, things pulled out of the wardrobes, etc. The worse situation is when they are involved – with hanging curtains, for example, and the result is usually a clean house, a tired housewife and an angry husband. The second task is to bake Christmas confectionery. These are small sweet pieces from nuts, cacao, coconut, sugar and many other ingredients of various colors, shapes and sweet tastes. These sweets are also sent and/or brought to friends with a wish of Merry Christmas and served usually on Christmas Eve (24 December). I created twelve sorts with around 100 pieces every year after my marriage – however, before Melbourne. It took me around three full days to make them. The last task is gifts. It is the same as in many countries. In our tradition, however, the donor is different. The gifts are given by Ježíšek (Yezheeshek), Jesus Christ in his baby age. Father or mother, mostly with their children, decorate the Christmas tree (spruce, pine or fir tree). Ježíšek places - secretly - the gifts during the Christmas Eve dinner under the tree. A lot of families set up a Nativity scene. It varies, from a simple paper image of Joseph and Mary with Jesus after his birth in Bethlehem and those who brought gifts to small Jesus, to a complicated wooden scene covering a large area in the room near the tree. Everything is presented in a fairy tale form for children. The most typical dish for the Christmas Eve dinner (after a whole day of fasting) is fish soup, fried carp and potato salad. People should not eat meat before midnight and therefore fish is served. This catholic tradition is not respected in all families and thus some people eat Wiener schnitzel (pork fillet coated in flour, egg and breadcrumbs). After the dinner, a small bell rings announcing that Ježíšek has brought the gifts and all of the family goes to the tree. One or more family members hand out the wrapped gifts with names of receivers on small cards. Unwrapping is a long procedure when all admire their own gifts and those of the others. Clearing away of the paper and ribbons closes the most laborious part of the first Christmas day, which was a working day during the communist regime. The regime was not able to erase Christmas, it only suspended its meaning by changing Vánoce (Christmas) to vánoce and replaced original names of the following two days to the 1st and 2nd Christmas feast. Christmas Eve is the most important and happiest day for families in my country, however, a very sad for people who are alone. All shops are closed and a very few restaurants are open. The loneliness is very strong. The two following days, 25 and 26 December (public holidays) are usually dedicated to the visiting of broader family members, friends, exhibitions, concerts, theaters. Young couples – usually shortly after marriage - present their rebellion and leave the family and even the country so as not to celebrate. However, there are not too many of them. Even though the Congress is in summer, it is good to know that the Czech Republic has a very low number of people who believe in God but who celebrate the catholic holy day in a merry way, focused on children and their happy eyes, who maintain hundreds of churches and relicts with respect to the historical development and who use other holy days during the year mainly to practice their hobbies. Czechs do not take meaningful things too seriously and like humor. The most famous Czech is a fictitious figure of theatre plays – a figure who is the best writer, composer, inventor of all ever invented things since the end of 19 century, ….- Jára Cimrman. Ingenieurgesellschaft für Interfaces mbH (IGI), Kreuztal, Germany is an innovative German vendor of photogrammetric hardware, software and workflows. IGI is very pleased to offer the IGI Ambassador Award via The ISPRS Foundation (TIF). This new award will be offered to young scientists in photogrammetry and laser scanning coming from regionally under-represented African countries and allows for visits at IGI‘s Central Office, Kreuztal, Germany, and active participation at international Workshops, Conferences, and Symposia. Bylaws: The award is funded by a donation of 2,500 EURO per year from 2014 to 2016. As it is focussed on supporting applicants from regionally under-represented African countries, it is a restricted grant of TIF. It is the intention of the donor to support 1-2 young researchers per year. Deadlines for applications are March 31st and September 30th. Eligible candidates are chosen by the TIF Grants Evaluation Committee in cooperation with an IGI Representative. The ISPRS Foundation (TIF) could offer Travel Grants to all ISPRS Midterm Symposia 2014. This has continued the Foundation’s tradition in funding travel grants to deserving individuals especially coming from developing and reform countries since ist inception in 2004. In the following further reports of travel grant receipients are given, which once more underline the importance of financial assistance to Young Researchers in the fields of Photogrammetry, Remote Sensing, and Spatial Information Sciences. The formal deliberations of the 2012 ISPRS Congress held in Melbourne, Australia, are now available at www.isprs.org/documents/archive/Volume-A/2012-Melbourne/. This proceedings volume contains the Congress programme, the official ISPRS documents, and lots of additional information on the Congress and on ISPRS. It once more demonstrates the great success of the Congress. Ordinary Members will receive a bound copy per mail within the next few weeks. President Chen Jun and Secretary General Christian Heipke handed over one of the first Vol. A. of the Melbourne Congress to the Ordinary Member of Myanmar during the recent Asian Conference of Remote Sensing (ACRS 2014), together with ISPRS promotion material. 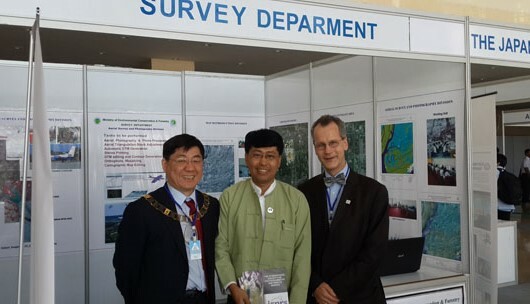 The photo shows Thant Sin Oo from the Myanmar Survey department holding the ISPRS Biennial Report, together with Chen Jun (left) and Christian Heipke (right). ISPRS recently signed a Memorandum of Understanding with OSGeo, the Open Source Geospatial Foundation. OSGeo is active in all areas related to open source and open data in the geospatial field and thus has many common interest with ISPRS. Anybody interested in this new possibility for cooperation and sharing of software and data should contact the OSGeo representative of ISPRS, Maria Brovelli at maria.brovelli@diiar-topo.polimi.it or the ISPRS Secretary General. The ISPRS book series, a long standing publication of the society, has a new direction and is now soliciting authored books. All royalties will go to the authors. The Canadian Institute of Geomatics (CIG) is pleased to announce its new President, Mr. Alex Giannelia, President of The Airborne Sensing Corporation. Mr. Giannelia was sworn in at the CIG Annual General Meeting held on October 6, 2014 at the Toronto Marriott Downtown Eaton Centre, Toronto Ontario. He is joined on the CIG Executive Board by President Elect Dr. Ahmed El-Rabbany, P.Eng., Professor in Geomatics Engineering, and Graduate Program Director at the Department of Civil Engineering with Ryerson University, Toronto; Immediate Past President Mr. Steve Guillemette, Information Consultant with the City of Quebec and manager of its Geomatics Division of Sustainable Development and Infrastructure; and Treasurer Mr. Gilles Champoux, retired from the Directorate of Real Property Planning with National Defense Headquarters in Ottawa. The above are joined on the Executive by the new CIG Vice-President Mr. Yves Léger, M.Sc., GISP, and Manager of the Geographic Information Systems Division with the City of Saint John, New Brunswick. ISPRS takes this opportunity to thank outgoing president Mr. Steve Guillemette for the great support he has extended to ISPRS and welcomes the new CIG officers. We are certain that we will see a continuation of the successful cooperation with our Canadian friends under the new CIG board. On behalf of ISPRS, President Chen Jun thanks Laurent for his great contributions to the French Society and to ISPRS. With his continuous efforts, ISPRS has been able to establish a closer link with SFPT, and more French scientists are now active in different ISPRS commissions and working groups. At the same time, ISPRS is looking forward to continuing the close collaboration with Marc Pierrot-Deseilligny and the new SFPT board. At the Technical Commission II Midterm Symposium, held in Toronto, Ontario on Oct. 6-8, 2014, Filip Biljecki, PhD Researcher at the Delft University of Technology presented a procedural modelling engine that generates synthetic 3D city models in the CityGML format and in multiple levels of detail. Filip has made these datasets available free of charge on his web site for everybody to use. Learn more at: http://3dgeoinfo.bk.tudelft.nl/biljecki/Random3Dcity.html. Recognising the need to improve our understanding of the Earth system and enhance our ability for informed decision-making for the benefit of our planet and the sustainability of our societies, over 150 governments and leading international organisations are participating in the Group on Earth Observations, or GEO, to coordinate the construction of a Global Earth Observation System of Systems (GEOSS) by the year 2015. In this context the European Commission has recently published a new book on capacity building for GEOSS. See here for more details. The ISPRS Joint Workshop PIA15-HRIGI15, "Photogrammetric Image Analysis - High Resolution Imagery for Geospatial Information, to be held in Munich, Germany from March 25-27, 2015, is proving to be a great success. At the full paper deadline, more than 50 contributions have been submitted. The workshop is still open for abstract submission - the deadline is Dec, 15, 2015. The organisers cordially invite contributions from all interested parties. The ISPRS Geospatial Week 2015 will take place in Montpellier (La Grande Motte), a beautiful Mediterranean city of the South of France, from 28th September to 3rd October 2015. La Grande Motte is situated on the border of Camargue, region of the delta of the river Rhone, and is the sea resort and marina of Montpellier which has an outstanding architecture and has been classified "20th century heritage site" by the French ministry of culture. The ISPRS Geospatial Week features a full working week a very rich scientific program around geoinformation (from data collection and information extraction, to data quality control and dissemination through services) with a mix of methodology-oriented and thematic-oriented events that will enable communities to meet, to exchange, and cross-fertilize. Future Earth is a global research platform aiming to provide knowledge and support to accelerate our transformations to a sustainable world. It is sponsored by the Science and Technology Alliance for Global Sustainability comprising the International Council for Science (ICSU), the International Social Science Council (ISSC), the Belmont Forum of funding agencies, the United Nations Educational, Scientific, and Cultural Organization (UNESCO), the United Nations Environment Programme (UNEP), the United Nations University (UNU), and the World Meteorological Organization as an observer. 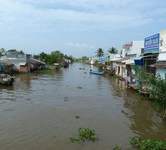 Dynamic Planet, Global Development and Transformations towards Sustainability are its three research themes. These depend critically on the availability and utilization of reliable information at both local and global scale. With the advancement of remote sensing and spatial information technology, more and more spatial data sets at both global and local scales have been produced in the past and will be generated continuously in the future. Supporting Future Earth with reliable global geo-information is becoming a key challenge for assuring a successful global understanding, environmental change analysis, transformational development and dynamic modeling. This joint workshop will present the latest development of global spatial data production and sharing, exchange successful application experiences of global geo-information, examine up-to-date user requirements and key gaps, and identify major challenges. It aims at promoting the multi-disciplinary collaboration towards providing reliable global geo-information to support Future Earth. Applications of global geo-information in global understanding, environmental change analysis, dynamic modeling and transformational development. A major international conference entitled “Our Common Future under Climate Change” will take place on 7-10 July 2015 in Paris, ahead of the UNFCCC 21st Conference of the Parties that is expected to adopt a new climate agreement. The science conference will discuss the IPCC findings and new research since the publication of AR5 with a strong focus on solutions, as well as considering climate adaptation and mitigation in the broader context of global environmental change. Organizers : Siberian State Academy of Geodesy and Exhibition organizer LLC "Interexpo GeoSiberia"
takes place in Obergurgl (Austria) from 5-11 July 2015. During that week participants will be learning innovative practical and methodological skills to characterize complex terrain and object features using close- and near range remote sensing techniques. Both theoretical lectures and practical field-work assignments are planned. TC IV of ISPRS met in May in China for a memorable symposium, perfectly organised by Jiang Jie. Under the leadership of Fabio Remondino, a very successful Commission V Symposium was held this summer in Northern Italy. During 6th-8th, August, 2014, an International Workshop on Open Data for Science and Sustainability in Developing Countries was held in United Nations Offices, Nairobi, Kenya. A unique initiative endorsed by ICSU, the International Council for Science - Sustainable Deltas 2015 - (SD2015) was launched in September at the ’Deltas in Times of Climate Change II International Conference’ in Rotterdam. The aim of the initiative is to focus attention and research on the value and vulnerability of deltas worldwide, and promote and enhance international and regional cooperation among scientists, policymakers and other stakeholders. SciDataCon2014, the International Conference on Data Sharing and Integration for Global Sustainability, took place from 2-5 November in New Delhi, India. The Conference was motivated by the conviction that the most significant research challenges – and in particular the pressing issues relating to global sustainability in the face of ongoing natural and human induced changes to the planetary system – cannot be properly addressed without paying attention to issues relating to equitable access to quality-assured and interoperable datasets and their long-term management and preservation. Ogashawara, Igor, Moreno-Madriñán, Max J.